[By Nick] As we continue on this ice cream source odyssey of mine, we take the flavor less traveled, mint. Well in my case anyway. Just like coffee, I just recently started acquiring a taste for mint. Also like coffee though, it has to be a team player and not try to dominate everything. If I want to taste some potent mint, I’ll just use some Listerine. 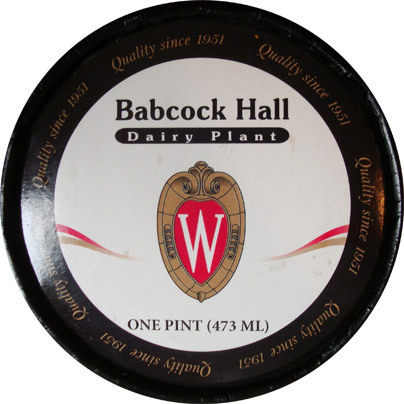 Today’s pint is brought to us from the University of Wisconsin-Madison, Babcock Hall Mint Chocolate Cookie. 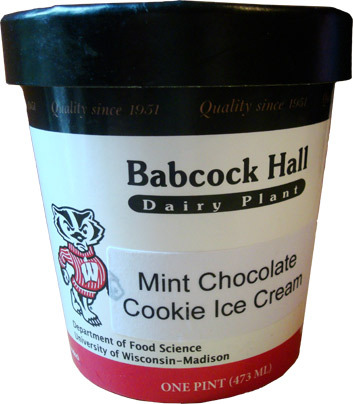 Is it just me or does the idea of your college having its own ice cream plant seem surreal? If I knew that was possible, I think that might have influenced my decision of what school to go to. I guess if it’s spectacular ice cream, I could always just transfer. Now we all know Dubba is an enthusiast of cookies and cream ice cream. So as an ode to him, I thought it would be a nice change of pace to take a shot at this slight twist on the classic. My only worry going into this review is that this pint might taste as if I just brushed my teeth and decided to eat some Oreos right after. Hopefully the two flavors will play nicely with one another. They have billed this pint as being “chocked full of cookies” and they weren't kidding. There are little bits of chocolate cookies spread evenly throughout the pint as well as big chunks showing up on multiple occasions. The cookies bittersweet qualities blended perfectly with the cool, refreshing mint. I’m really surprised at how well this combination is working here. The mint flavor was walking on the line of dental hygiene but was kept in check by the chocolate cookies. 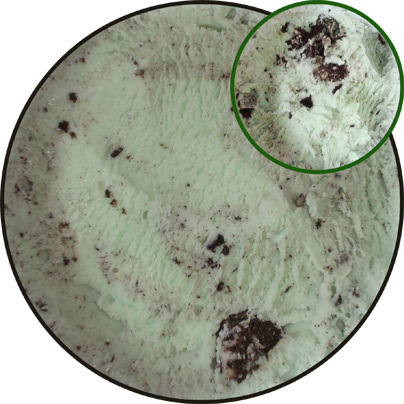 If this had been normal mint chip ice cream, I could see this pint being an utter failure. The cookies are truly the saving grace here and I find myself hitting more and more clusters as I make my way through the pint. Some of the cookies even manage to stay crisp lending an added crunch every once and awhile. 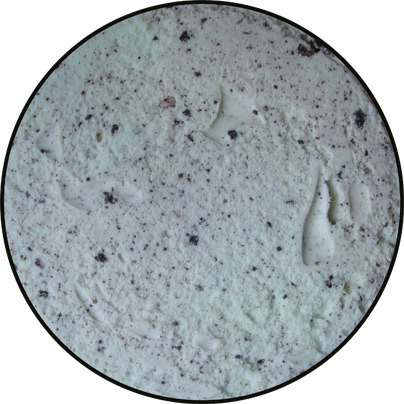 The texture of the ice cream is fairly standard with no signs of grit and has no chew to it. It was fairly creamy as well and I’d say it was quite comparable to that of Breyers or Turkey Hill. All in all, this was a solid flavor combination. Did this convert me to becoming a mint lover? Not by a long shot, but this was a nice addition to the cookies and cream world. Now it has me thinking of all the possibilities out there. Strawberry C&C? That’s a given. Cinnamon C&C? That would be very interesting. Caramel C&C? Now that’s something that needs to become a reality, the sooner the better. Verdict? A successful deviation on a classic. Buy This Flavor Again? I can see myself wanting this one on occasion. This one has the look of a excellent cookies & cream flavor, and I already know babcock makes good stuff.... and now I'm in the mood for c&c. I go to palace that has frozen custard. It is so creamy & awesome. They always have chocolate, vanilla, & a special flavor of the day, today's flavor is strawberry Oreo. Can't wait to try! Ya the straw Oreo was really good. I got it on a waffle cone. It had a real nice strawberry flavor and the Oreos were still crunchy. Cookies and cream flavors are so much better when they can have fresh Oreos in them.